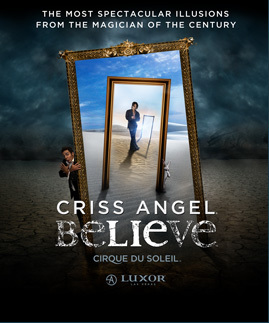 I foolishly bought tickets to Cirque Du Soleil’s Criss Angel Believe while in Las Vegas without reading any reviews. I figured that the floor value of a Cirque show was going to be decent and that it would pair very nicely with magic and Criss Angel. First the stuff that didn’t belong at all; the crude and predictable poop jokes. I can appreciate a good poop joke as much as the next guy when it’s appropriate, but that’s not what I was looking for in Believe. The jokes themselves weren’t even clever, they were typical Beavis and Butthead “haha, #2..ahaha” stuff. I suspect this was probably intended as some kind of comic relief in between illusion, but the acts were so bland and commonplace that it left you unfulfilled. To follow that up with a crude joke is not entertainment. Most of Angel’s tricks were the same stuff you can see in virtually any magic act on (or off) the Strip. Whether that’s creating birds from air, predicting three things the audience is going to say on a piece of paper supposedly locked up before hand, or sawing someone in half. If you’re thinking the show could’ve been saved by some high-flying Cirque Du Soleil acrobatic stunts, don’t hold your breath. There was virtually none, and very little of what there was was above and beyond the theatrics you get in a normal magician’s act. There are a couple of explosions/flashy effects and a monster or two that for some reason Criss Angel and company needs to fight. That’s basically the extent of the Cirque involvement. To make it worse Criss Angel spent a good amount of the eighty minutes promoting his own products. He gave away a magic kit, he boasted about one of his Youtube videos, showed off his motorcycles, showed clips of Mindfreak and even begged the audience to tweet at him. All in all it was a pretty disappointing show; take a hint and see Penn & Teller. Lately I’ve noticed that some of my senses seem to be heightened. Not super-powers heightened (Not yet anyway, crossing my fingers there) but just picking up on things I normally don’t notice. Specifically my sense of smell has picked up. I’m now noticing the scents around me much clearer than I used to whether it’s a steeping cup of tea, or the aroma of my dinner. I’m also seemingly noticing colors more sharply too. I especially noticed this during Christmas, when the Christmas lights just seemed to be brighter and crisper. I’m pretty sure my eyesight hasn’t actually gotten better, especially since over the past year I’ve noticed one or two of those random black floaters in my vision occasionally. Hearing is another sense that I’m noticing has changed. Particularly that I’m picking up on more nuance within things. This can be as simple as a whirl of a print spool in the background, or background percussion on a music track. Taste is the easy one. Most peoples taste buds change, and I heard somewhere every seven or so years is common. I’ve definitely gone from a very very picky eater as a kid to pretty much being able to find enjoyable food in just about any setting.